In the past, and even still to this day, Apple and Microsoft have competed against each other in different technology markets. From software to smartphones to full desktop operating systems, there is a choice to be made. I have always used Windows computers, though I have used other Apple products. Macs always seemed out of reach due to their cost and the fact that I didn’t know the OS. However, I will soon be leaving Windows behind in favor of a MacBook Pro. Here are a few reasons why I am doing so, some more general and some specific to music and musicians. 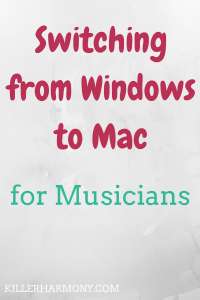 While a lot of music programs run on both Mac and Windows, Mac is more common for musicians. Or so it seems. With a Mac, you already have a free audio recording and editing software included, GarageBand. Other programs, such as Finale, MuseScore, or Audacity work with Windows. However, I have encountered some small problems with music and Windows. Like how a music technology textbook only referenced Mac tutorials or Mac software. All of my other devices are from Apple. I have an iPhone and iPad. The two can sync with each other, but not with a Windows computer. While continuity is not necessary, it is something to consider if you have the option. I have slowly switched to using Pages instead of Word, and I also use iCal more than Google Calendar or any other digital system. Now, sometimes, that can be limiting. Using different companies for different technologies means that you aren’t stuck within one. I get that, but I have become accustomed to iOS, and prefer it even to Windows. A MacBook of some kind is just the natural progression. Yes, Macs cost a lot, but I have heard they are worth it. They last for years, and it is free to upgrade to the newest version of macOS. I have had an iPad 2 for more than four years, and it still works well. My iPad mini 2 is three years old and still works like a charm. There is still a bit of an Apple premium, but I have never heard of Mac users complaining about their computers. I have heard, complaints about Windows machines…and have complained myself. My old Windows laptop lost its charger after only a couple of years. It basically became a portable desktop. Macs come with a full productivity suite, iWork, already included. There’s also the iLife suite, which includes iMovie and GarageBand. I can use FaceTime and iBooks, and I don’t have to worry about complicated installations. Those programs also come for free. I don’t have to pay a subscription fee to use them, like I would with Office. Macs also have iCal, Notes, and Reminders, ready to go. A Mac comes with most of what I need, and I will probably only download a few programs as needed, such as music notation software. That’s it. Some might find the lack of options limiting, but I find it liberating. I know that no matter what I choose, it will be fine. And, the fewer options means that I didn’t have to research tons of products before making a decision. I ultimately settled for a refurbished Pro from 2016. It saved a bit of money, and the model is less than a year old. I have yet to receive it in the mail, but I am excited to switch to using Apple for (basically) everything. A few years ago, I took a computer music class where we worked with Macs. I learned a bit about how to use the different system, and I have worked in a Mac lab since then. While I have never used a Mac daily, I know enough about the differences to switch. I have also experienced Windows 10, and I’m not a big fan. My current Windows laptop still runs 8.1, and I’m glad. Friends of mine who upgraded to 10 saw a decrease in speed and other important factors. Now that I have graduated from college, it’s time for a new computer. I’m in a new phase in my life, so why not change what operating system I use? Macs are more common for creative professionals; I have continuity, the quality is great. Macs come with so much in the box, the small selection of products cuts down on decisions, and I know enough about them to get started. I’m more than ready to go from Windows to Mac. Have you switched from Windows to Mac? Or vice versa? Comment below!